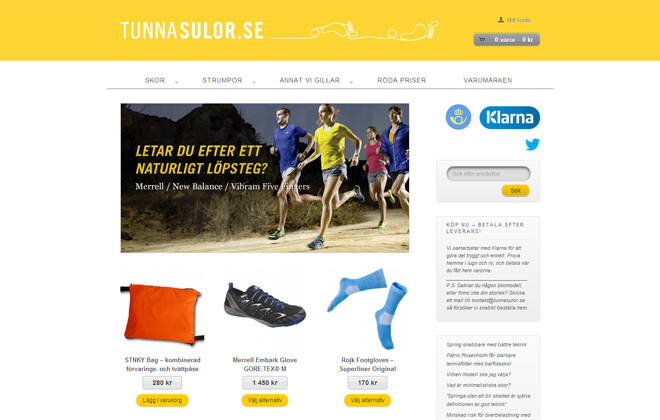 Tunna Sulor is an online e-commerce selling running footwear with a thin sole. The site is based on WooCommerce and the WooStore theme. Chamigo helped out with the development of a child-theme to restyling the site according to the company’s graphical profile. The payment gateway that is used is the Klarna Gateway extension developed by Niklas Högefjord at Krokedil Produktionsbyrå. The newsletter is a MailChimp integration using the MailChimp List Subscribe Form plugin. Buy some shoes now at tunnasulor.se and start running!